Prev How to Make Sand Candles Next Falling Asleep While Nursing: Is It Really Such a Big Deal? Summer for my two boys is about as idyllic as it gets. Long, lazy days of riding their bikes around town. Hours spent hanging out in their tree house, trading baseball cards and friendly insults with their best buddies. Late afternoon jumps into the ol’ swimmin’ hole to cool off. And when they get hungry, mom is always ready with a plate full of freshly baked cookies and a glass of ice-cold lemonade. 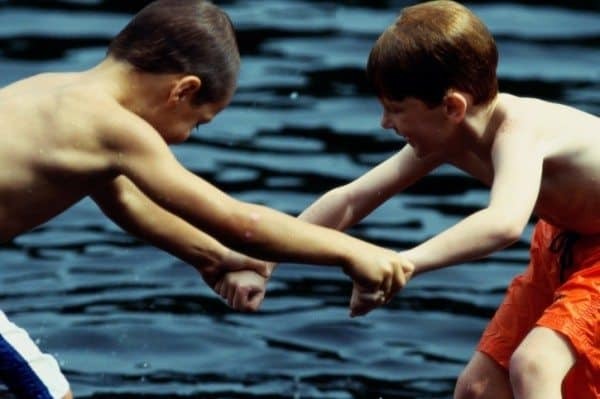 Oh, wait—that’s summer for the boys in the movie Stand By Me, not our summer. Our summer blows. Okay, it doesn’t exactly blow, but it’s still not quite the classic, unstructured free-for-all summer that my sisters and I enjoyed when we were growing up in the 70’s. I’d love nothing more than to give that experience to my boys, but unfortunately, times have changed and it never works out the way I hope it will. Or, more accurately, a Norman Bates summer. Because ten seconds in, the kids are wrestling over a Pokémon card, it’s 112 degrees outside and I’m screaming my lungs out in the shower because it’s the only room in our house with a lock on it. Honestly, why is doing nothing so damn time consuming? You’d think kids who’ve been stuck inside a classroom for nine long months would revel in completely aimless days, but you’d think wrong. My kids—and those of most of my friends— instead enter summer vacation much like a prisoner reenters civilian life. They gaze at the TV, they beg to play video games, they get on each other’s nerves, they tattle, they whine, they fight, they dramatically sigh, “What should we doooooo?” Kids used to their lives being scheduled become completely overwhelmed by the sudden influx of free time. Conversely, my sudden lack of free time completely overwhelms me. Now instead of long, uninterrupted hours to write, there are two little people constantly barging into my office telling me they’re bored. (By the way, “bored” has 1,203 syllables when said by a 10-year-old boy.) I tried to be firm and made a rule that I wasn’t to be bothered unless someone was bleeding, but hello—I have two boys. Someone is always bleeding. What can I do to keep them busy, yet also get some time to myself? An all-day camp isn’t the solution, either, because we tried that one year and all of us were miserable. So this summer, I think we’re just going to compromise. A few half-day sports camps, a few half-day art camps, swimming, and at least a few planned outings a week. Even a trip to the library or the movies or Costco burns up time and is a nice break from being outside in the hot Texas sun. The rest of the time, they can do whatever they want, be it watch TV, play on the computer or (gasp) read a book. I’m also going to give up the dream of the boys just running out the door and instead schedule playdates with their friends from school. Sure it might be a lame modern parent thing to do, but who cares if it buys them a few hours of fun and me a few hours of working time? Besides, I’d rather they play with their friends inside our house than get heat exhaustion riding their bikes around the block looking for trouble. I know by doing all of this, our summer won’t be as classic and timeless as the one in Stand By Me and you know what? I’m okay with that. We’ll still have a good time together until school starts. And besides, didn’t the boys in that movie find a dead body in the woods? That probably won’t happen at art camp. Does my pie chart look like your summer line-up? Let me know if I’m missing something! I can’t believe you gave bleeding only 5% of the share. Either you are really optimistic or your walls are totally padded. I too live in Austin and I have four very grumpy/bored kids…we are going the same route as you – some day camp type things, swim team, cooking classes at Central Market, sending them to any relative crazy enough to take them…sometimes it is hard to get out of bed and face another day of the screaming/whining/fighting/complaining. 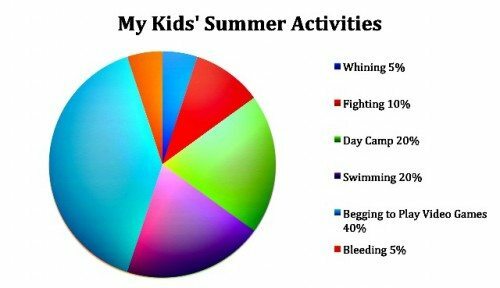 There is no sweating on your pie chart, so I am going to assume that you are sweating during all of the listed activities. Ah, summer…. Hahahahaha. This is great! We have a loose schedule that we follow, including a daily fun activity. We also have a ‘bored board’ with suggestions for fun activities they could do. We play together as a family, I let them get as messy as they want, and STILL my chart looks like yours. I’m so sick of people telling me or ‘insinuating’ that I’m doing something wrong because our chart looks like… well.. what you drew! So glad to know I’m not the only one that deals with stuff like this! =) GOOD LUCK everyone! We have the same kind of schedule – a little of this and a little of that. Some days, it works great. Other days, it makes me batty. I’ve made a little list of emergency-things-to-do-that-distract-them-when-I-feel-like-I’m-going-out-of-my-mind. This includes such items as: scavenger hunts, starbucks frappucino trips, and emergency drop-offs at Grandmas, so mom can steal away on her own for 15 minutes. Good luck! Your kids only spend 5% of their time whining? No way! You are one lucky woman. Over the years I’ve developed quite the list of cheap summer activities; but none of them seem to have quite the attraction for the children as does sitting around and whining at me. Our home would also have a “Playing with Legos” slot for the kids’ chart and a “Stepping on Legos” slot for the parents’s chart. Still, I’m very thankful for Legos. So quiet, so captivating, even if they are so painful. I would walk across a 1,000 lego pieces barefoot in exchange for the hours of quiet play they produce. Thank you, Ole Kirk Christiansen, for your plastic wonders! Interesting that your pie chart tie of 30% is between talking with military recruiters and enjoying my kids. Is there any correlation there? And I love that hiding is a close 2nd! Too funny!! We went with the half day camps for a few weeks, and I added swim team this year. There are practices four days a week, and a weekly swim meet. They are exhausted after both! The one things that drive me up a tree is all our neighbor kids ringing my doorbell every three minutes. And, because of the heat, no one wants (can) play outside. I can barely handle my two in my house. I certainly don’t want the six other kids from around the corner in here too!